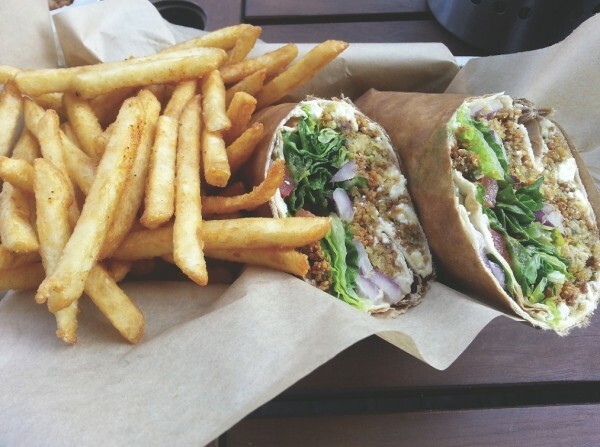 Döner Delight: The street-cart döner wrap with fries from Spitz. I’d guess that most regular readers of this column are familiar with the gyro, a mainstay of Greek restaurants here. Less well-known is the gyro-like meat preparation called shawarma, and even more obscure is the dÃ¶ner. However, they’re all essentially the same thing. Shawarma is rotisserie-grilled meat—usually a combination of beef and lamb, but also sometimes chicken, turkey or veal—cooked on a rotating vertical spit. Stacks of seasoned meat and fat are shaped into an inverted cone, placed on a spit and slow-roasted. The meat gets crisp on the outside and is thinly sliced and typically served on flatbread such as pita or lavash. Standard accompaniments include onion, tomato, cucumber, Armenian-style pickles, tzatziki sauce or tahini. As I mentioned, in Greece this type of meat is used to make gyros. In Turkey, it’s called a dÃ¶ner. All three are virtually identical. If you’re hunting for shawarma, it would be a no-brainer to make a trek to a place called Shawarma King, right? So I did. The Millcreek restaurant is nothing if not colorful. Hot-pink walls adorned with paintings that might have been made by PBS’ Bob Ross, orange leather booths and splashes of Tiffany blue dominate the décor. The menu—unless you’re knowledgeable about Middle Eastern cuisine—takes some time to get familiar with, so I recommend ordering a plate of hummus ($2.99) to nibble on while you peruse it. Chickpeas are pureed with tahini and garlic, then drizzled with olive oil, sprinkled with ground sumac and adorned with a single black olive. The hummus was delicious, but the flatbread that accompanied it was dry and tough. Skewered meats—lamb and chicken—at Shawarma King come in the form of either kabobs or tikka, the latter served with basmati rice. However, my favorite entree-type dish is the lamb koozi ($12.99), a house specialty. Chunks of lamb are braised until almost falling-off-the-bone tender and served on nicely flavored basmati rice seasoned with raisins, toasted almonds and onions. The koozi comes with a side of meat “soup” which tasted like lamb broth. But we came for the shawarma, and shawarma we did have. First off, you should know that Shawarma King owner Ehsan Suhail makes his shawarma from scratch. At many Middle Eastern and Greek restaurants, the shawarma or gyro meat is a pre-made cone of pressed and processed meats. Suhail gave me a close-up look at his shawarmas, and they’re made with clearly identifiable stacks of meat, glistening on the rotisserie. It’s a craft he learned in Iraq, and the meat served at his restaurant is halal and sourced locally. So, you’d think that the beef/lamb shawarma ($7.50/wrap or $10.99/platter) would be a knockout. However, I found it to be a bit dry and under-seasoned, somewhat lackluster overall. But the exact opposite is true of the chicken shawarma. It’s tender and rich-tasting, juicy and served with housemade garlic-lemon sauce (toum), tomato, lettuce and pickle slices. Garlic lovers will fantasize about the toum once they’ve tried it. For those with less garlicky inclinations, try the shish taok, which is two skewers of grilled chicken with green peppers, tomato, basmati rice and yogurt on the side ($10.99). The service at Shawarma King was hunky dory, and the owner and staff couldn’t have been friendlier. Sadly, service is a big issue at Spitz, which promotes itself as “home of the dÃ¶ner kebab.” I’ll get to that momentarily, but first, I suggest that when you visit Spitz that you order from the excellent selection of craft cocktails, wine or beer right off the bat, because you may be there a while. On my first visit to Spitz, I was scheduled to pick up my wife at the airport, and allotted myself what I thought was plenty of time to grab a couple dÃ¶ner sandwiches to go. A half-hour after ordering, I was still waiting on my sandwiches, and was ultimately late getting to the airport. On a second visit—with only four other customers at Spitz—it only took 20 minutes to get my order, but it was the wrong order. So, the total time to get it right was approximately 35 minutes. I understand that the food at Spitz is made-to-order, and I’m generally a patient man, but waiting a half-hour for a sandwich or a salad in what is said by the owners to be a “quick-service eatery” really tests my patience. That being said, the service, though slow, is very friendly, and the vibe is funky and fun, with eclectic music. So, place an order at the counter and settle in. You’d be nuts not to try a street-cart dÃ¶ner ($7.50), which is available as a sandwich with foccacia or a lavash wrap and a choice of beef and lamb, chicken, falafel, mixed meats or veggies. The beef and lamb shawarma-style mixture is outstanding: perfectly spiced and generously portioned. Ditto the falafel, which I have to say is the best falafel I’ve had in Utah. The wraps and sandwiches come with green pepper, cucumber, onion, romaine, tomato, tzatziki and a zippy chili sauce. Sitting outside at a sidewalk table, I like to nibble on the heaping plate of delicately seasoned fried chickpeas and olives ($4.50). Surprisingly, the chickpeas turn light and airy, like popcorn, when deep-fried. And for those who enjoy heat, I heartily recommend the incendiary spicy dÃ¶ner ($8.50) with extra chili sauce and pepperoncinis. The fact that I and many of my colleagues love Spitz despite some service glitches is testament to just how great the food and drink is.